I'm at home this week enjoying a few days away from the office. This is the sewing room project I'm working on - just finishing putting it together and adding some borders. I might even try quilting it myself. 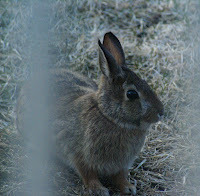 Early this morning I saw this little rabbit in the backyard. I thought is was nice that he came to visit. 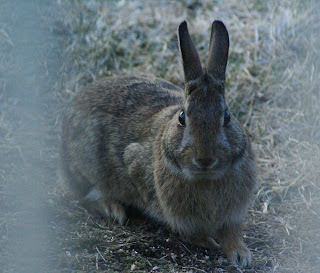 He didn't stay very long though and it was hard to photograph him through the patio door. He was eating the seeds on the ground under the bird feeder.... and from the looks of the tulips coming up in the back garden I think he is eating them too. We have other visitors to our garden this morning. Not so cute as the rabbit, but I love those crazy yellow eyes. Lots of these birds around the feeders. I think they're called 'cow birds' - not really sure.